Scientists from the University of Utah announced last Thursday that the Yellowstone supervolcano holds considerably more magma than previously thought. The enormous caldera, approximately 30 by 50 miles across in both directions, was long thought to hold a chamber of molten rock some 18 miles wide, but new imaging technology has revealed a second chamber hidden beneath the original — and it's a big one. Containing some 10,000 cubic kilometers of molten material, the new discovery is over 4.5 times larger than the shallow magma chamber and is situated above an even bigger magma plume nearly 400 miles at its widest point. Given the new measurements, shaky estimates on when the Yellowstone supervolcano might erupt might have you tossing and turning at night — but many geologists would consider it wasted energy. 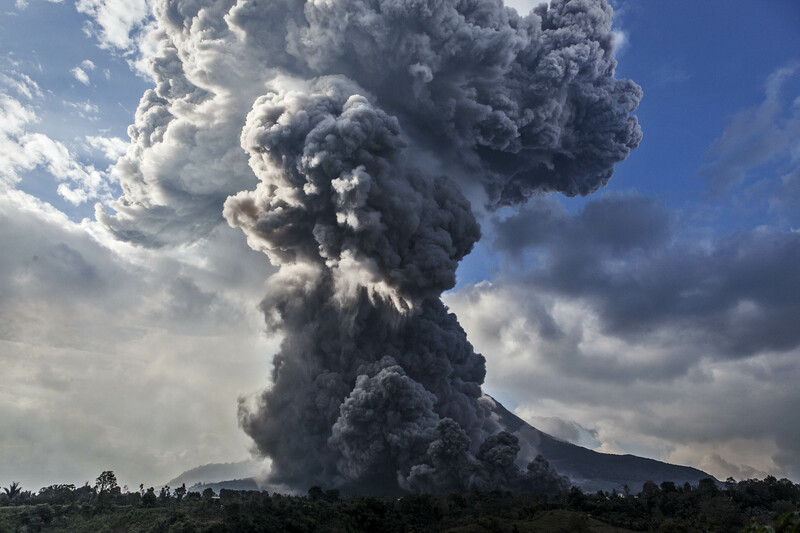 Before you start dreaming up 2012 doomsday scenarios in your head during your coffee break (who would've thought that an RV could outrun the searing pyroclastic flows of a supermassive volcano? Nice driving, John Cusack! ), it's important to remember that the reason scientists aren't packing their bags for a long trip off of this planet is because there's really no reason to worry. Honestly. Everyone can go back to business as usual. "Yellowstone is one of the biggest supervolcanoes in the world," said Ilya Bindeman, associate professor of geological sciences at the University of Oregon, in an interview with the National Science Foundation in March 2014. "Sometimes it erupts quietly with lava flow, but once or twice every million years, it erupts very violently, forming large calderas." Bindeman explained that the likelihood of a gigantic, destructive eruption in our lifetime, however, is slim. "Our research of the pattern of such volcanism in two older, 'complete' caldera clusters in the wake of Yellowstone allows a prognosis that Yellowstone is on a dying cycle, rather than on a ramping up cycle," he said. If, by some strange chance, the Yellowstone supervolcano erupted in modern times, it would indeed wreak major havoc on the global ecosystem and would essentially wipe out hundreds of miles of wildlife and human activity, explained Bindeman, but in the unlikely event that that happened, it wouldn't be for another 1 to 2 million years. According to the National Parks Service, the last time the Yellowstone caldera erupted some 174,000 years ago, it created what is known as the West Thumb of Yellowstone Lake, and it's still very much active (the hot springs and geysers are direct evidence of that, said the NPS) — just not enough to trigger apocalyptic warnings. "Another caldera-forming eruption is theoretically possible, but it is very unlikely in the next thousand or even 10,000 years," indicates the NPS on it's official park site. Of course, even if Yellowstone's supervolcano did erupt, it's not as if we could do anything about it, if that makes you feel any better. "Nothing can be done to prevent an eruption," they explain. "The temperatures, pressures, physical characteristics of partially molten rock, and immensity of the magma chamber are beyond human ability to impact — much less control." When one group of scientists used the count of all the known supervolcanoes to calculate the approximate frequency of eruptions, they found that only 1.4 supereruptions occur every one million years. That's not to say that a supervolcano will occur every million years at regular intervals. Many millions of years could pass without a supereruption or many supervolcanoes could erupt in just a short period. The geological record does suggest supervolcanoes occur in clusters, but the clusters are not regular enough to serve as the basis for predictions of future eruptions. You can breathe easy now.